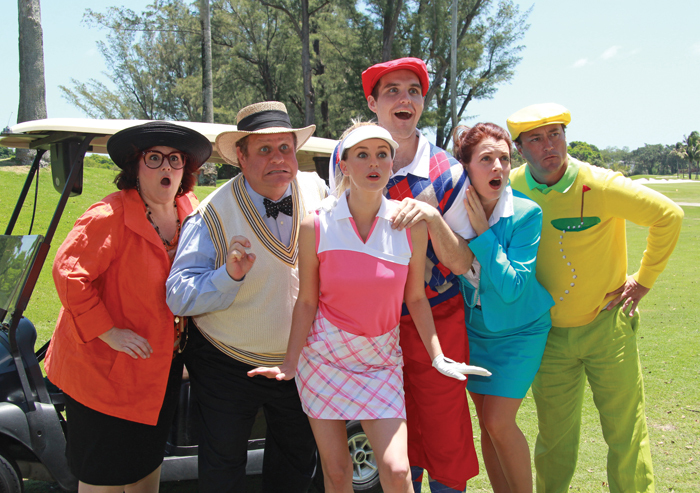 Filled with mistaken identities and over-the-top romances, Actors’ Playhouse presents the hilarious comedy The Fox on the Fairway from May 8 – June 2, 2013 at the Miracle Theatre. The Fox on the Fairway is a charming screwball adventure about love, life, and man’s eternal love affair with … golf. Written by Ken Ludwig (Lend Me a Tenor, Moon Over Buffalo, Crazy For You), the author hits a hole-in-one with his tribute to the great English farces of the 1930s and 1940s. Two rival country clubs, Quail Valley and Crouching Squirrel, prepare for their annual grudge match. A massive private wager is made between the two CEOs just before the best player switches teams. The Fox on the Fairway is a “tour-de-course” of rapid-fire chip shots and frenzied miscommunications. Preview performances of The Fox on the Fairway will be held Wednesday and Thursday, May 8 and 9 at 8 p.m. The show will open on Friday, May 10 at 8 p.m. and play through June 2, 2013. Evening performances will be held Wednesday through Saturday at 8 p.m., with afternoon matinees on Sunday at 2 p.m. Preview night tickets on the first Wednesday and Thursday are $35. Tickets for weeknights and matinees are $40, and on Friday and Saturday evenings $48. The theatre offers a 10 percent senior discount rate the day of performance and $15 student rush tickets 15 minutes prior to curtain with identification. Discounts are based on availability and exclude Saturday and Sunday. Group discounted rates are offered for 15 or more through our group sales department. Single tickets may be purchased through the box office at 305-444-9293 or online at www.actorsplayhouse.org.